Welcome to the Herschel Hoard, card #579, on my journey to 600 different Herschel Walker cards. 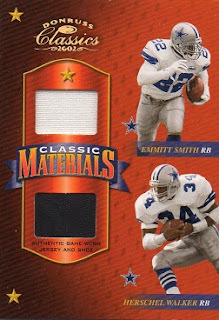 This 2002 Donruss Classic Materials card, is a nice dual memorabilia card, contain a swatch from a game used jersey of Dallas Cowboy legend, Emmitt Smith; and a piece of a shoe, worn in a game by Herschel Walker. 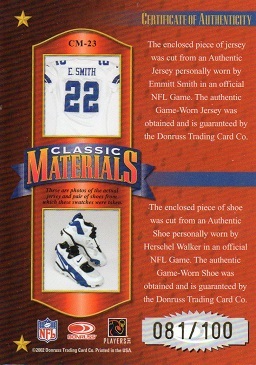 This example is a serial numbered card to 100, and as shown, this is #81 of the set.